USA District Superior, Fr. Arnaud Rostand, gave a short conference at St. Vincent de Paul Church in Kansas City, MO on September 26. 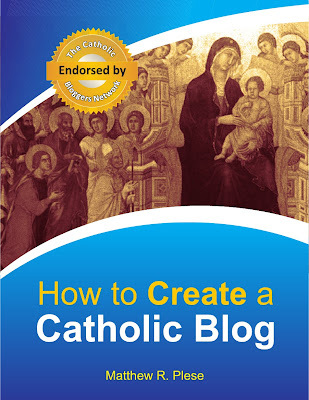 He outlines briefly the history of the Society of St. Pius X, the example and principles of Archbishop Marcel Lefebvre, and the Society's continuing struggle to defend Catholic Tradition. Fr. Rostand also speaks about the supernatural attitude we should have regarding recent events between the SSPX and Rome. The SSPX are proud to report that yesterday, on the Feast of St. Michael the Archangel, Br. Gabriel Mary pronounced his perpetual vows after nine years of religious life. Three others brothers renewed their vows for one and three years. 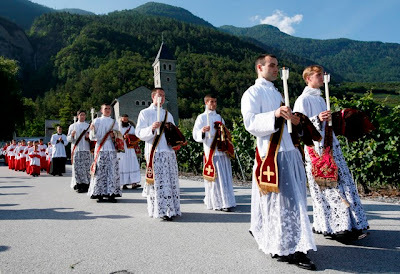 According to the Statutes written by Archbishop Lefebvre for the SSPX’s brothers, the brothers make their vows for one year, then twice for a three-year period, before being allowed to make their perpetual vows. The first religious profession takes place after a year of novitiate. Receive this Cross, a sign of the Passion of Jesus Christ so that it may be for you the foundation of faith, defense against adversity, and the everlasting standard of victory. 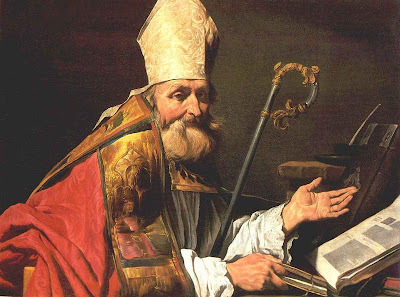 It is a great satisfaction for me to report that, fourteen years from the foundation of the Society, its organization, its purpose―particularly sacerdotal―of forming priests shaped in the spirit of Our Lord, in the spirit of the Holy Sacrifice of the Mass―is finding its realization in the ministry, in the practice of the priestly life that you lead now, (…) which shows also your concern to keep up and to perfect your desire for holiness. This is our outstanding importance. 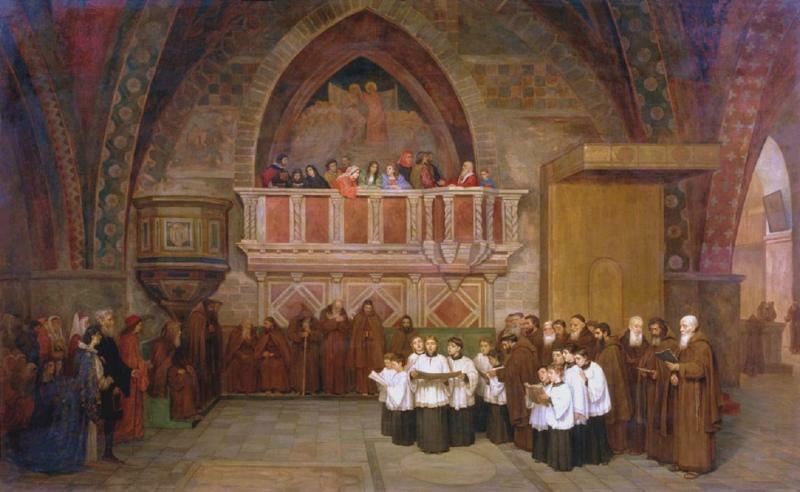 …And then it is another great trial that we all suffer: the trial of the Church, because we finally have to recognize it, the exterior situation and in a certain way the juridical situation (at last juridical in the sense of purely literal law), well, now it is not normal, that is true. Thus we are not in a normal relation with the bishops, with the priests who are around us and who also have an apostolate―what apostolate?―but in the end, they are priests who are still in the parishes; the relations with them are obviously not the relations, which we normally should have had in the holy Church. So, no normal relations with the bishops, no normal relations with the priests who are around us, no normal relations with men religious or sisters, with a good part of the faithful, with Rome itself. It is an appalling, horrible trial, because it is abnormal. But the anomaly does not come from us. 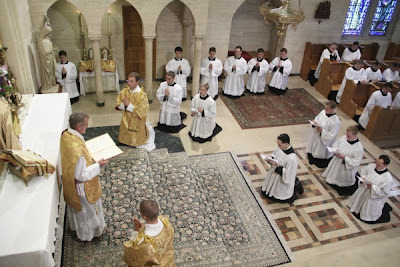 It is from them that it comes, from all those who have not followed the Tradition of the Church, who have themselves put themselves permanently outside all legality, outside the Faith, yes―even outside the Faith! But however it may be, we are convinced of this, it is they who are wrong, who have changed course, who have broken with the Tradition of the Church, who have rushed into novelties, we are convinced of this. That is why we do not rejoin them and why we cannot work with them; we cannot collaborate with the people who depart from the spirit of the Church, from the Tradition of the Church. But that puts us in a very critical situation of breaking with that mass of Church people who are departing from the Tradition of the Church. That makes thus for an unlikely situation, assuredly unbelievable, that is at times for us a cause for sorrow, for a desire to see the Church rediscover her way, that is to say, her Tradition―at least not the Church, but the people of the Church―for a desire that the Church not be torn anymore as it is right now, and finally that her passion in some way end. Source: Archbishop Lefebvre gave this address to the priests of the French District on December 13, 1984. Excerpt from "The Restoration of Christian Culture"
I spent this weekend reading the majority of John Senior's fantastic work The Restoration of Christian Culture. I can not recommend it highly enough to my readers. I'd like to share some of the passages from the book as well as some brief thoughts. Quoting from John Senior's fantastic work The Restoration of Christian Culture, "Work is a physical necessity; if you don't work you don't eat. Prayer is a necessity of obligation; if you don't pray you will not enter the Kingdom. Prayer is a duty, an office; it is free, voluntary payment of the debt we owe to God for existence and grace. The Latin word for duty is officium, and the perfect prayer of the Church is its Divine Office; St. Benedict call it the opus Dei, the work of God" (60). John Senior continues, "I have cited the Latin for the meaning of many words not for the pretense of learning, but because their meaning is Latin. 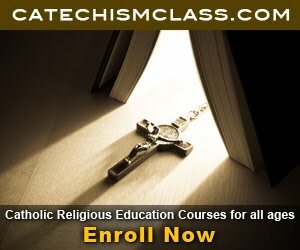 Latin is the language of the Roman Catholic Church; you can repudiate the tradition and overthrow the Church; but you cannot have the tradition and the Church without its language. And though the Second Vatican Council permitted the substitution of vernacular liturgies where pastoral reasons suggested their usefulness, it commanded that the Latin be preserved. 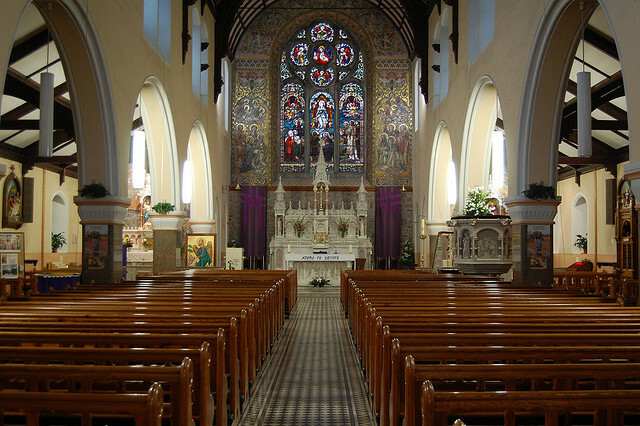 The Catholic Faith is so intimately bound to the two thousand years of Latin prayers any attempt to live the Catholic life without them will result in its attrition and ultimate apostasy - which we have witnessed even in the few years of the vernacular experiment. We must return to the Faith of our fathers by way of prayer of our fathers" (60 - 61). John Senior's works are beautifully said and express an absolute reality - the Church is timeless; she is outside of time. Only by restoring true Christian culture, as Senior explains throughout his book, will Christ again reign in our hearts, our homes, and our families. Christ must reign. And how can we bring about the reign of Christ without frequent prayer? Prayer is necessary. It is essential for the spiritual life. A life spent in good works of charity that has no prayer is a life built on bad soil. And no soul whose life is built in bad soil can inherit everlasting life. You might be concerned and ask "how many hours of prayer must I perform daily?" Quoting again from Senior on the topic, "The strictly cloistered monk and nun lead that life in the highest degree, but each of us in his station must pay his due. There are three degrees of prayer: The first, of the consecrated religious, is total. They pray always, according to the counsel of Our Lord. Their whole life is the Divine Office, Mass, spiritual reading, mental prayer... They pray eight hours, sleep eight hours and divine the other eight between physical work and recreation... The third degree is for those in the married state (or single life) who offer a tithe of their time for prayer - about two and a half hours per day - with eight hours for work, eight for sleep, and the remaining five and a half for recreation with the family" (62-63). Make an effort - an obligation - pray the Divine Office and other pious devotions for 2 and a half hours each day. And no prayer is greater than the Mass. 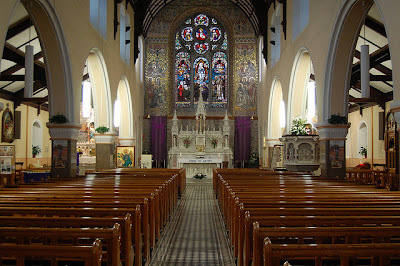 If possible, attend Holy Mass daily. We quote one final time from Senior who said, "Whatever we do in the political and social order, the indispensable foundation is prayer, the heart of which is the Holy Sacrifice of the Mass, the perfect prayer of Christ Himself, Priest and Victim, recreating in an unbloodly manner the bloody, selfsame Sacrifice of Calvary. What is Christian Culture? It is essentially the Mass" (16-17). To conclude with his words on our culture: "Our Lord explains in the Parable of the Sower that the seed of His love will only grow in a certain soil - and that is the soil of Christian Culture, which is the work of music in the wide sense, including as well as tunes that are sung, art, literature, games, architecture - all so many instruments in the orchestra which plays day and night the music of lovers; and if it is disordered, then the love of Christ will not grow. It is an obvious fact that here in the United States now, the Devil has seized these instruments to play a danse macabre, a dance of death, especially through what we call the "media," the film, television, radio, record, book, magazine and newspaper industries. The restoration of culture, spiritually, morally, physically, demands the cultivation of the soil in which the love of Christ can grow, and that means we must, as they say, rethink priorities" (21). The first thing that inspires enthusiasm in learning is the greatness of the teacher. Who is greater than the Mother of God? Who is more glorious than the one whom Glory itself chose? Who is more chaste than the one who bore a body without contact with another body? For why should I mention her other virtues? She was a virgin not only in body but also in mind. No guile stained her sincerity. She was humble in heart, serious in speech, prudent in mind, sparing of words, studious in reading. She put her hope not in riches but in the prayer of the poor. There was nothing gloomy in her eyes, nothing forward in her words, nothing undignified in her acts. There was not a foolish movement, not an unrestrained step. She was never irritable. In this way her outward appearance itself became the image of her soul, the representation of what is approved. We ought to be able to recognize a well-ordered house on the very threshold: it should show at the very first entrance that there is no darkness hidden inside it. In the same way our soul, hindered by no bodily restraints, should shine forth like a lamp placed inside. 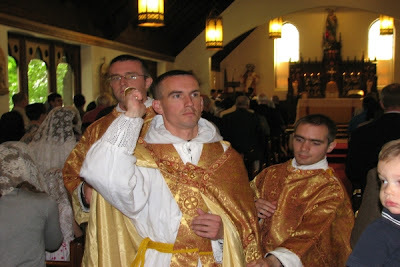 St. Jude's Church near Philadelphia, PA joyfully celebrated the recent priestly ordination of one of its parishioners, Fr. Augustine, a Benedictine at Our Lady Of Guadalupe Monastery in Silver City, New Mexico. Father celebrated a Solemn First Mass for his home parish on Sunday, June 26. 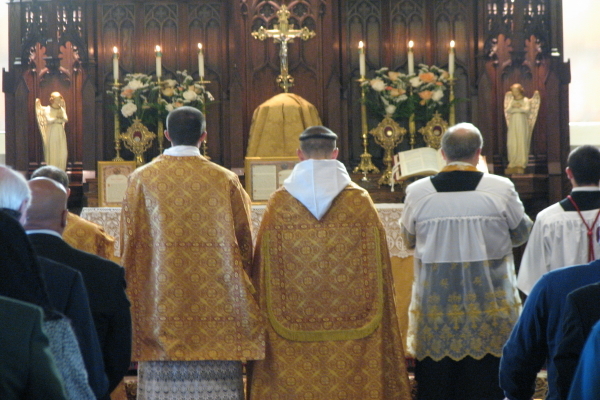 Below are some photos from that Mass. O God, our heavenly Father, who lovest mankind, and art most merciful and compassionate, have mercy upon thy servants for whom I humbly pray thee, and commend to thy gracious care and protection. Be thou, O God, their guide and guardian in all their endeavors, lead them in the path of thy truth, and draw them nearer to thee, that they may lead a godly and righteous life in thy love and fear; doing thy will in all things. Give them grace that they may be temperate, industrious, dilligent, devout and charitable. 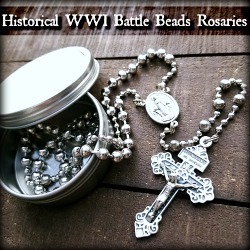 Defend them against the assaults of the enemy, and grant them wisdom and strength to resist all temptation and corruption of this life; and direct them in the way of salvation, through the merits of thy Son, our Saviour Jesus Christ, and the intercessions of his Holy Mother and thy blessed Saints. Amen. Let us pray for Fr. Augustine. What activities should we, as Catholics, perform on the anniversary of our baptism? Well, perhaps I am getting ahead of myself. Do you even remember the date on which you were baptized? You remember your birthday and secular holidays. For those readers from the United States, I'm sure you can recall the secular meaning of July 4th, can you not? Yet, why do you fail to remember heavenly occassions? Have you failed to recall the date on which your soul was purchased from satan. That's right, it has always been taught that we can not be saved without Baptism. Before your Baptism your soul belonged to satan. Whether you were baptized as a child or as an adult, you (or your parents on your behalf) made a series of promises to the Church and you are bound to keep your share of those promises. Thus, your first responsibility is to find out when you were baptized - the month, day, and year. Next, write this on your calendar each and every year. 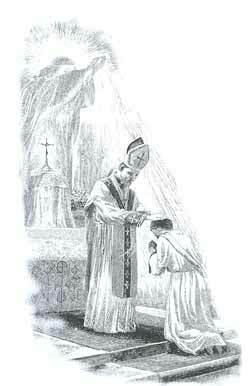 On the anniversary of your baptism, you should renew your baptismal promises and re-read the Rite of Baptism. To aid you in this, I share below the Rite of Baptism performed according the 1962 Rubrics, which are still used by traditional Catholics. Even if you were baptized in a different Rite (after all, you might have been baptized in an Eastern Catholic Rite), this Rite (or a similar one) should be read each year on your Baptism as a reminder of the transformation in your soul on that day. Your soul will never the be same. If you go to Heaven or Hell, your soul - by Baptism - is marked. There is a mark present on your soul in a real way so that in the life hereafter it will be visible - no matter if you go to Heaven or Hell. 1. The priest says the greeting: Peace be with you. Priest: What is your name? P (to each): N., what are you asking of God's Church? P (to each): What does faith hold out to you? Stop here. Before you were baptized, you (or your parents on your behalf) asked for what? They asked for Faith. Faith is necessary for salvation. Our Lord, in His divine will in ordering of the universe, has made it so that we (as humans) can not love that which we do not know. We must first know something in order to love it. By Faith, we know God and by knowing God, we can love Him. Recall it was He who first loved us, while we were yet sinners (and unborn). It was then that our Lord gave up His Divine life in upspeakable love for us. We ask, before our baptism, for Faith. Do you have Faith? Do you believe in God, the Father Almighty, and in His Son, the Redeemer of the World, and in the Holy Ghost? Do you belief that our Lord was crucified for our sins and, in so doing, died for all mankind? Do you believe that He rose again from the dead physically and ascended psychically into Heaven? Do you believe in the Real Presence of our Lord in the Eucharist? Do you believe all that the Church of God teaches? You asked for Faith. Do you have it? Do you frequently pray the Act of Faith, a prayer which we we ask God to increase our Faith? If not, add it to your daily morning prayers (that is, assuming that you are faithful in your obligation to pray every morning). 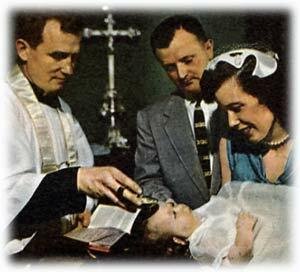 And, what does the Rite of Baptism tell us that Faith will give us? It says "Everlasting life". Without Faith, we can not love God. If we have no love for God, He does not dwell within us. And if our Lord does not dwell within us, we can not be saved and possess everlasting life. P (to each): If, then, you wish to inherit everlasting life, keep the commandments, "Love the Lord your God with all your heart, with all your soul, and with all your mind; and your neighbor as yourself." Now ask yourself, do you keep the Commandments? Can we say as the Psalmist proclaims, "Therefore have I loved thy commandments above gold and the topaz"? Do you love God more than men? Do you love God more than your family, your possessions, and even your own life? Our Divine Redeemer has said that "Thou shalt love the Lord thy God with thy whole heart, and with thy whole soul, and with thy whole mind. This is the greatest and the first commandment" (Matthew 22:37-38). Do you love God more than everything else in the world? And if you say yes, do your actions show it? "Faith without works is dead," says St. James. I ask that you continue through this examination. Reference the Rite of Baptism and continue to search your own soul. If you find yourself in sin, go to Confession (assuming you have already been baptized in the Catholic Faith). Go to Confession to receive the pardon of Almighty God.